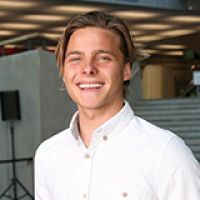 He loves the variety of his role, says Michael Lough who is currently interning at New Zealand Trade and Enterprise in Vancouver through the AUT Internz International Scholarship Programme. “I love the range of work! I really enjoy meeting new people and learning from them, and I definitely appreciate Canada’s polite and open culture. Choosing to study both business and communications was an easy decision, Michael says. Deciding where to study wasn’t difficult, he adds. Make the most of the opportunities available to you, Michael advises. He had amazing times at AUT, says Michael who received a Vice-Chancellor’s Significant Student Scholarship to support his studies.